BEACHWOOD, Ohio – A man who essentially came back to life after his heart stopped for nearly 45 minutes is now telling the story of his astounding near-death experience. According to FOX 4’s sister station, FOX 8 in Cleveland, Brian Miller suffered a massive heart attack and seemed fine until the next day when he began experiencing Ventricular Fibrillation, which is a usually deadly fluttering pattern of the heart where blood is no longer being pumped through the body. Without treatment, the condition can kill a person in just a few minutes. After about 45 minutes of Miller being without a heart-rate, pulse, blood pressure or oxygen to his brain, he miraculously awoke with a regular heartbeat and without any damage to his brain. Miller said he had beautiful visions of the after-life as he walked toward heaven, which included both flowers and light. He said he had a loved one who had recently passed tell him he needed to go back. Great Video here at link. a miracle occurred through which Our Lord’s face on the veil became very distinct and glowed with a soft light. ~33 AD: Veronica wipes Our Lord’s face with her veil and an image of His Holy Face miraculously appears on the veil. Veronica later passes the relic of the veil to Clement I (3rd successor of St. Peter). The relic of the veil was kept in catacombs for the next 3 centuries during persecutions of the Church. After that time, Holy Veil was placed in the church that was constructed over the tomb of St. Peter (later to become the Basilica of St. Peter). The Holy Veil has since been kept intact throughout the centuries. 1843-1847: Sister Mary of St. Peter, a Carmelite nun in Tours France experiences a series of revelations from Our Lord about a powerful devotion He wished to be established worldwide – the devotion to His Holy Face. The express purpose of this devotion was to make reparation for the numerous blasphemies and profanities taking place in the world but was also established as a means through which we can all appeal to God for anything we wish. The devotion revealed by Our Lord to Sister Mary of St. Peter consists primarily of reciting the “Golden Arrow Prayer” and the “Litany of the Holy Face” (as seen on our Devotion page). It also consists of some additional prayers said with a chaplet (or small rosary) and wearing of a Holy Face Cross engraved with the words “Blessed be the Name of God” on the front and “Begone, Satan!” on the back. 1849: Shortly after the death of Sister Mary of St. Peter, Pope Pius IX ordered public prayers be offered in all churches in Rome to implore God’s mercy on the Papal States due to revolution occurring at the time. 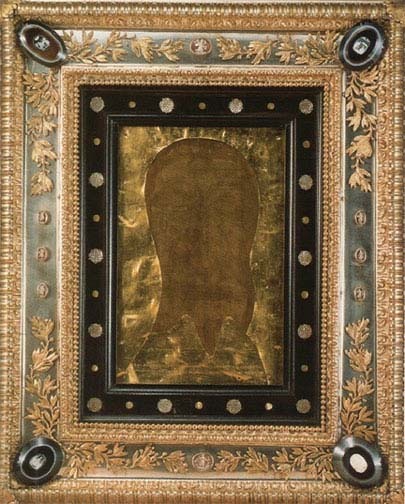 As part of these public prayers, a three-day exposition of the relic of Veronica’s veil was held for public veneration at St. Peter’s Basilica. On the third day of the showing, a miracle occurred through which Our Lord’s face on the veil became very distinct and glowed with a soft light. The Canons of the Basilica ordered the bells rung at sight of the miracle, which attracted crowds of people. The miracle lasted for three hours, and was attested to by an apostolic notary during the incident. That same evening etchings and representations of the effigy were made and touched to the relic of Veronica’s veil and later sent abroad. Afterward, a custom was introduced where copies of the veil were sent to Rome to be touched to the original veil, making them objects of special devotion. These copies are typically noted to have stamps and/or wax authenticating seals in the lower corner, indicating it was touched to the original veil. Here are links to high resolution framed and unframed photos of one of these 3rd class relics. There are more copies of these images on our Holy Face Images page as well. Feel free to have any of these images printed to assist you with practicing the Holy Face devotion. 1849-1876: Two of the relics were sent to Leo Dupont who continued the Holy Face devotion privately throughout the rest of his life until 1876. Leo Dupont hung one of these images in his parlor and kept a crystal oil lamp in front of it, lit continuously as a sign of veneration. Soon afterward first class miracles of healings started to occur to those who said the devotional prayers (“Golden Arrow Prayer”, the “Litany of the Holy Face”) with Leo Dupont in front of his Holy Face image, and who anointed themselves with the oil from his lamp. These miracles continued for 30 years and were so numerous that Pope Pius IX declared Leo Dupont to be perhaps one of the greatest miracle workers in Church history! The fact that so many first class miracles occurred through this devotion attests to the authenticity of the revelations from Our Lord to Sister Mary of St. Peter. 1885: While devotion to the Holy Face of Jesus has always existed in some form or another, these revelations and miraculous occurrences lead to this special devotion being established by Pope Leo XIII as an Archconfraternity; and contrary to custom, He immediately established it for the ENTIRE WORLD. 1885-1897: It was a well-known fact the St. Therese of Lisieux and her family registered as members of the Archconfraternity of Reparation to the Holy Face at Tours France and that St. Therese herself was so devoted to this that she added the title to her name at the time she took the habit. This is why you will often see St. Therese referred to as St. Therese of the Child Jesus “and of the Holy Face”. See our St. Therese page for more details. 2000 and beyond: Become a part of this timeline yourself by practicing this devotion as explained on this site and by spreading the devotion to others! To read details about Sister Mary of St. Peter’s revelations and the miracles associated with Leo Dupont, please read the “The Holy Man of Tours” (the life of Leo Dupont), and “The Golden Arrow” (the autobiography of Sister Mary of St. Peter), both available from fromwww.tanbooks.com. SUNBURY — Nineteen-year-old satanist Miranda Barbour admits to killing Troy LaFerrara of Port Trevorton. Barbour body count at 22? After the Lady from heaven had given her advice, he was on his way by the avenue that goes directly to Mexico; being happy and assured of success, carrying with great care what he bore in his tilma, being careful; that nothing would slip from his hands, and enjoying the fragrance of the variety of the beautiful flowers. When he reached the bishop’s palace, there came to meet him the majordomo and other servants of the prelate. He begged them to tell the bishop that he wished to see him, but none were willing, pretending not to hear him, probably because it was too early, or because they already knew him as being of the molesting type, because he was pestering them; and, moreover, they had been advised by their co-workers that they had lost sight of him, when they had followed him. He waited a long time. When they saw that he had been there a long time, standing, crestfallen, doing nothing, waiting to be called, and appearing like he had something which he carried in his tilma, they came near him, to see what he had and to satisfy themselves. Juan Diego, seeing that he could not hide what he had, and on account of that he would be molested, pushed or mauled, uncovered his tilma a little, and there were the flowers; and upon seeing that they were all different rosas de Castilla, and out of season, they were thoroughly amazed, also because they were so fresh and in full bloom, so fragrant and so beautiful. They tried to seize and pull some out, but they were not successful the three times they dared to take them. They were not lucky because when then tried to get them, they were unable to see real flowers. Instead, they appeared painted or stamped or sewn on the cloth. Then they went to tell the bishop what they had seen and that the Indian who had come so many times wished to see him, and that he had reason enough so long anxiously eager to see him. He unfolded his white cloth, where he had the flowers; and when they scattered on the floor, all the different varieties of rosas de Castilla, suddenly there appeared the drawing of the precious Image of the ever-virgin Holy Mary, Mother of God, in the manner as she is today kept in the temple at Tepeyacac, which is named Guadalupe. When the bishop saw the image, he and all who were present fell to their knees. She was greatly admired. They arose to see her; they shuddered and, with sorrow, they demonstrated that they contemplated her with their hearts and minds. The bishop, with sorrowful tears, prayed and begged forgiveness for not having attended her wish and request. When he rose to his feet, he untied from Juan Diego’s neck the cloth on which appeared the Image of the Lady from heaven. Then he took it to be placed in his chapel. Juan Diego remained one more day in the bishop’s house, at his request. The following day he told him: Well! show us where the Lady from heaven wished her temple be erected.” Immediately, he invited all those present to go. La Salette, France What follows is the original testimony of Mélanie Calvat, who, along with Maximim, is the only witness able to tell the story of the apparition accurately. What follows is the original testimony of Mélanie Calvat, who, along with Maximim, is the only witness able to tell the story of the apparition accurately. After having relayed what happened by word of mouth countless times, she decided to write it down in 1878. On November 15, 1879 it was published for the first time with the “Imprimatur” of His Excellency Mgr. Zola, Bishop of Lecce. In 1904, just a few weeks before Mélanie’s death, it was reprinted “ne varietur” at Lyon. Mélanie’s personal account is extremely rare. We have followed her text to the letter here. Published by the Shepherdess of La Salette, with Imprimatur by the Bishop of Lecce. The Holy Virgin had a most pretty cross hanging around Her neck. This cross seemed golden, (I say golden rather than gold-plated, for I have sometimes seen objects which were golden with various shades of gold, which had a much more beautiful effect on my eyes than simple gold-plate). On this shining, beautiful cross, there was a Christ, it was our Lord on the Cross. Near one end of the Cross there was a hammer, and at the other end, a pair of tongs. The Christ was skin-coloured, but He shone dazzlingly; and the light that shone forth from His holy body seemed like brightly shining darts which pierced my heart with the desire to melt inside Him. At times, the Christ appeared to be dead. His head was bent forward and His body seemed to give way, as if about to fall, had He not been held back by the nails which held Him to the Cross. I felt a deep compassion and would have liked to tell His unknown love to the whole world, and to let seep into mortal souls the most heartfelt love and gratitude towards a GOD who had no need whatsoever of us to be everything He is, was, and always will be. And yet, O love that men cannot understand, He made Himself man, and wanted to die, yes, die, so as to better inscribe in our souls and in our memory, the passionate love He has for us! Oh, how wretched am I to find myself so poor in my expression of the love of our good Savior for us! But, in another way, how happy we are to be able to feel more deeply that which we cannot express! I have selected some parts.To read the whole report click on link below. Fr. Peyramale noticed a girl’s head encircled by a halo as he gave her Holy Communion. On a June day in 1858, Fr. Peyramale noticed a girl’s head encircled by a halo as he gave her Holy Communion. When she raised her head, he recognised her as Bernadette Soubirous. What follows are words, either spoken or written, by Bernadette herself. The Lady was dressed in white, with a white veil on her head, and a blue sash at her waist. A Rosary of white beads on a golden chain was on her right arm. On that cold winter’s day, her feet were bare, but on each foot was a golden rose radiant with the warmth of summer. A group scientists in Italy have claimed that neutron radiation caused by an earthquake in 33 AD could have induced the image that many believe to be Christ on the Holy Shroud of Turin. They also believe this seismic activity at that time led to false carbon dating of the cloth in 1988. Since Tuesday morning, hundreds of believers have been rushing to Our Lady of Lourdes Shrine in Chennai after news spread that a statue of mother Mary blinked its eyes. On the left entrance of the shrine, perched atop a glass-fronted wall, is the statue of mother Mary. On Tuesday morning, news of the statue blinking its eyes spread and a huge crowd gathered outside the shrine to witness the “miracle”. The news also generated social media frenzy. While believers “thanked God for the miracle”, sceptics questioned its veracity. Josephine Roche, a regular at the church, said she had never seen such a miracle in Chennai before. The shrine’s architecture itself is inspired from the Lourdes Shrine in France. “In France the original church was mainly built at the place where Mary herself is believed to have appeared to a shepherd girl,” Roche said. She believes “the miracle” will attract more pilgrims during the ongoing feast at the shrine, which is also one of the largest parishes in Chennai. But a rationalist and social activist, who did not want to be named, dismissed the incident as the church’s another crowd-pulling tactic. “Please ignore. Not worth wasting your time,” he said. Maalai Malar, a Tamil daily, reported that the church was cleaned recently for the celebrations. The glass wall was also refurbished, which might have created an illusion of the statue opening its eyes, the report said. HT’s attempt to contact father Joseph Andrew, in charge of the church, was unsuccessful as he was busy organising the feast. Christians flock to take photos of a statue of the Virgin Mary that weeps tears of oil, residents in the small Israeli town of Tarshiha say. Roped in rosary beads, a glistening statue of the Virgin Mary sits in a glass box, surrounded by worshippers who pray and sing songs. Osama Khoury said his wife found the object covered in oil not long ago. The statue spoke to his wife, and told her to fear not, Khoury said. Pictures and video at below link.